Signing the pledge "I Will Never Use Tobacco"
For some reason I had been thinking of taking my "I Will Never Use Tobacco" and Tobacco Death display over to the west side of Birmingham, Alabama. Saturday Morning April 17, the weather was divine in Birmingham, Alabama. I loaded up my old Dodge Caravan with signs, a large paint canvas drop cloth, black paint, and some painting supplies. I found an desolate parking lot on the west side of Birmingham, and got out and painted my 15' X 10' canvas with the message Www.TobaccoDeath.com . The sun dried the freshly painted canvas quickly. I threw the canvas in the back of the van, and drove up to the busy intersection that I wanted to work, but it was covered with African-American girls doing a fundraiser. I located the school teacher/sponsor of these girls to seek her thoughts on my individual volunteer work at this intersection. She kindly recommended that I go down a few blocks to the Five Points West intersection. Out of respect of this sponsor, I decided to leave. I parked my van in a mall parking lot at this famous Five Points West intersection. I believe the intersection has 24 lanes divided by four streets. I went in a discount store to buy some safety pins that I needed to attached a SMOKING KILLS basketball jersey to the back of my shirt. The young assistant manager pinned the jersey on my back. Then she walked me up to the front check-out counter and I discovered that the store didn't accept credit cards. Amazingly, she pulled out money from under the cash drawer and said that this money would cover my safety pins and bottle of water. What a blessing! However, I humbly found some loose change in my pocket, paid for the pins and put the cold water back in the cooler. "Hell is going to be longer than you think," proclaimed the African-American street corner preacher to his captive red-light audience, as I walked up. This preacher had on a Jesus T-Shirt. His very physical deliverance must have worn him down because he was gone pretty soon. (I wondered if he had seen the Passion of Christ movie, I haven't). I walked over to another corner and started setting up my banners and signs. I thought how valuable the hands of Bill Gates would be assisting me, as it was a little frustrating to my years of poker playing patience to hang my signs and banners on this kite flying day. Pretty soon the friendly waves and horns beeps of the estimated 95% African-Americans who passed by helped my fears, doubts, and frustrations fade away. A mother stopped by with her handsome teen sons Josh and Ben. They took my invitation to pledge "I Will Never Use Tobacco." This young mother shared while her sons signed the banner that they were fatherless. Just a little later I noticed a Fox TV 6 van backing up in the adjacent bank parking lot. The young TV reporter said that he had noticed me earlier and wanted to stop and see what was going on, while he was setting up his camera tripod to interview me. About the time Matthew the reporter was leaving someone tossed out an encouraging one dollar bill as they drove by. In mid-afternoon a man stopped on his bicycle, and began chatting with me about his smoking habit. I shook Wayne's hand and listen to him tell me that he had been smoking for a long time, but never had smoked in front of his mother or her home. "Wayne that's really nice that you respect your mother that much," I said to this 44-year-old man. He went on to tell me of having some cancer removed from his body a few years prior. 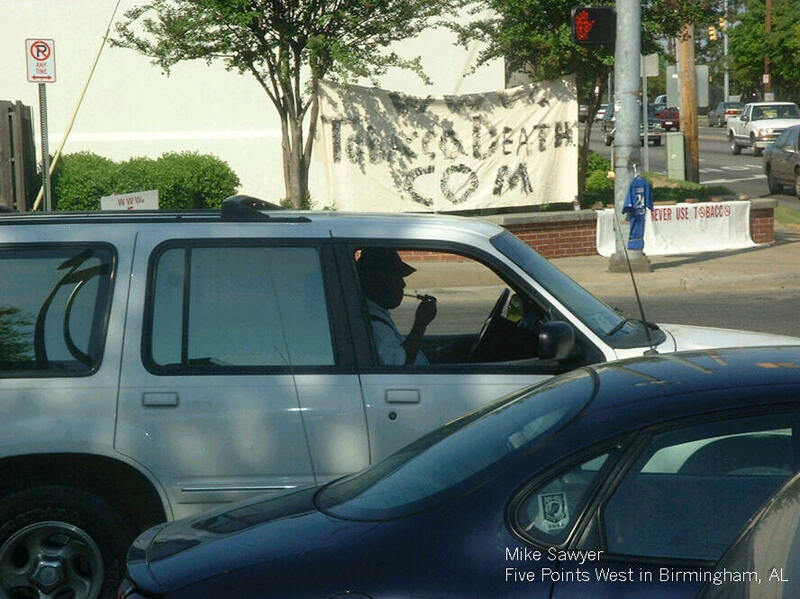 I observed more eating and cell phone talking in vehicles than smoking at this intersection. The reverberating rap music provided me free entertainment all day long from the clean and dressed up vehicles. Only one young man tapped his horn and taunted his cigarette to me. My hand instantly waved back with my head nodding to this upset smoker. I look forward to returning to this famous Birmingham intersection.